What are drawdowns and how do you manage them? by Sportstatist • 28.01.2019 • Comments Off on What are drawdowns and how do you manage them? The focus of many bettors is often on how much they could win when betting, but it’s just as important to think about how much you could lose. Drawdowns are a well-known concept within the finance industry, but how can it be applied to betting? Read on to find out. Rather, they typically make a strategy change or get out of the game completely long before then. At what point this happens is significantly dependent upon the risk attitudes of the bettor, but it is useful to have some means of defining and modelling it. The concepts of drawdown and maximum drawdown (MDD) are familiar within the world of financial investment. In this article, I will take a look at what they mean, what can be expected and how they can be handled. What are drawdown and maximum drawdown? Investopedia define drawdown and maximum drawdown respectively as the peak-to-trough (percentage) decline during a specific recorded period of an investment and the largest peak-to-trough (percentage) decline before a new peak is achieved. 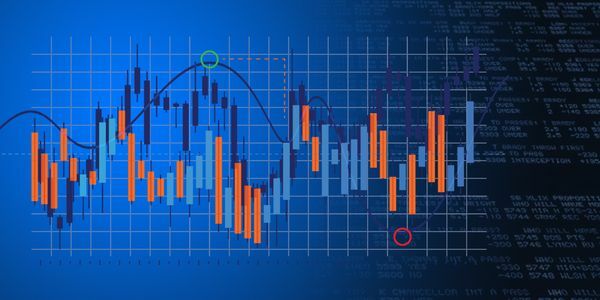 Because the profit history of a bettor follows much the same type of evolution as that of a financial investment, these concepts can be directly transferred to the world of betting. We might also reasonably consider the maximum drawdown to be synonymous with the largest decline in bankroll a bettor would realistically be willing to tolerate. In his e-book, Miguel considered a figure of 50%, although this is purely a subjective value. Hence, it would be helpful if we could model maximum drawdown expectations with a view to risk managing our betting experience. Miguel identifies a number of factors that will influence the size of the maximum drawdown (MDD). Unsurprisingly, the superior the profit expectation (and yield) the smaller the expected MDD will be. Similarly, bettors wagering longer odds will experience greater variances and be at risk to larger bankroll swings and hence larger expected MDD, all other things being the same. Miguel also explains that expected MDD increases at a logarithmic rate with the number of bets. For simple 50-50 binary propositions, for example, the expected length of the longest losing sequence in 2n bets is roughly equal to n.
Following Miguel, I have run a number of Monte Carlo simulations in an attempt to model expected MDD (in units) for different bettor scenarios over a series of 1,000 level stakes (1 unit) bets. Expected yields of 2% through to 20% (at 2% intervals) were considered for each of five different odds: 1.5, 2, 3, 5, and 10, making a total of 50 scenarios. Each was run with 10,000 iterations. The table below summarises the expected (mean) MDDs. Let’s consider a typical sharp handicapper who is betting odds of around 2. With a 53% strike rate they will show a yield of around 6%. 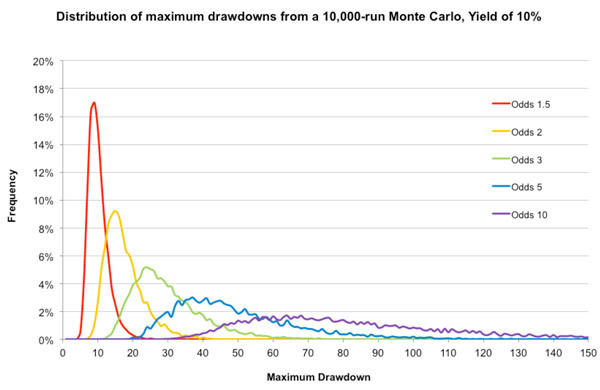 Over a series of 1,000 bets they can expect to suffer a maximum drawdown of about 22 units from a previous high. The biggest reason for inconsistency and suboptimal performance is emotional disruption to decision making. In contrast, now consider a typically skilled horse racing bettor with a 14% yield from average odds of around 5; their MDD is almost double (43 units). For weaker performances at longer odds, the expected MDD can be over 100 units. Start with a bankroll of 100 units and the implication is stark. Of course, as I remarked in my previous article, bettors who suffer the variances of betting longer odds will typically reduce their stake sizes relative to bettors who prefer shorter odds, thereby reducing in absolute terms the size of the MDD. The numbers in the above table should help in determining what sort of stake size is appropriate. Reducing stakes to 0.25 units, for example, will cut the MDD for a bettor with a 4% yield from odds of 10 from 100 to 25 units. With a starting bankroll of 100 units, that would be much less unpalatable. Of course the table above tells us what MDD to expect on average. It doesn’t say much about how MDDs might vary depending on how lucky or unlucky we have been. For that we need to plot some probability distributions. These are shown in the first chart below for the 10 scenarios where betting odds are 2. For each scenario, the probability distribution is positively skewed with a longer right hand tail on account of the possibility of some very high MDDs. Consequently the mean or expected MDD for each scenario will be larger than both the median and mode. (The mode, or most common, MDD corresponds to the high point of each distribution.) Ignore the imperfections in the curves; these would disappear for a larger number of Monte Carlo iterations which my computing processing power did not allow for. Consider the case for a yield of 6%. The most common MDD was 18 units. The average, however, was 22 units. And in my 10,000 iterations nearly a third of them were 25 units or more, the highest being 73. Averages are informative, but the shape of the probability distributions gives us useful additional information about the range of expectations under scenarios of good and bad luck. The second chart shows the five models scenarios for variable odds with a yield of 10%. The distributions of possible outcomes are hugely variable. 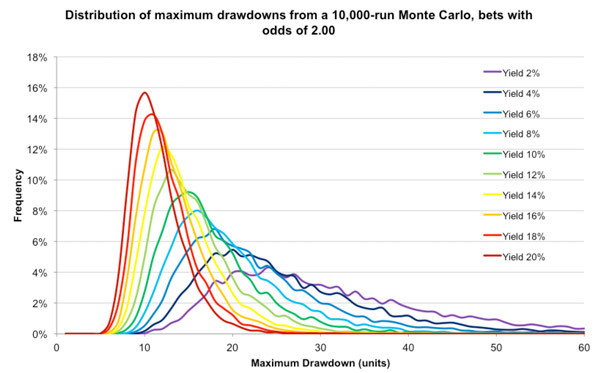 For betting odds of 10, for example, whilst the expected MDD is 84 units, a quarter of the Monte Carlo iterations were 100 or more, with one of them as high as 302. If you’re such a skilled long-odds bettor, a 1-in-10,000 occurrence such as this would arguably require stakes of 0.1 units for a 100-unit bankroll to reduce the size of MDD to tolerable levels. No one likes losing money when betting; that much is obvious. But it’s worse than that. It takes a greater percentage growth to recover a previous loss, because drawdowns destroy the bankroll that could have been making you profits whilst you are winning. The problem is exponential. It takes 11% growth to recover a 10% drawdown. But it takes a 100% growth to recover a 50% drawdown, and a 300% growth to recover a 75% drawdown. If you can detach yourself from the emotions of money making and losing, then you will be much better prepared to handle the roller coaster that is sports betting. Without any additional information about why either of those outcomes might have happened, we are more liable to draw false conclusions about their causes. Arguably success will breed an over confidence in our predictive abilities meaning we place more faith in ourselves than randomness should typically allow for. Failure, on the other hand, will have us throwing out methodologies before they have had a chance to fully demonstrate their true long term expectation. In the extreme, I can recall many years ago abandoning a betting system after just 10 bets, when 8 of them lost; such is the power of loss aversion. How do you manage drawdowns? Every profitable bettor will at some stage face a significant drawdown that will lead them to question their strategy. Learning to cope with them will possibly be the hardest task they face. The biggest reason for inconsistency and suboptimal performance is emotional disruption to decision making. Professional sports bettors try to strip the emotion out of their betting. If practiced well, a bettor should become as indifferent to a win as to a loss. Naturally, becoming so emotionally detached requires a certain level of confidence in one’s long term abilities, and the evidence to back that up. It takes a greater percentage growth to recover a previous loss because drawdowns destroy the bankroll that could have been making you profits. The folly of chasing losses is one of the golden rules of betting. But the mantra of increasing stakes when you are winning is just as erroneous, if potentially less catastrophic, unless managed sensibly through some variant of Kelly money management. Both of the above are examples of gamblers’ fallacies, ignoring the inherent randomness in the evolution of profits and losses, even for bettors with profitable long term expectation. In one betting history I have data for, the bettor dramatically increased stakes from around €50 to €400 after making a 4-figure profit during a sequence of just 278 bets. They lost almost all of it again in fewer than 100 more. I concluded my book on the Science, Psychology and Philosophy of Gambling with a summary of features that make an intelligent bettor. All of these should help with taking the emotion out of betting and learning how to cope with drawdowns. An intelligent bettor will think probabilistically rather than deterministically, recognising that most of what happens in betting is luck, where cause and effect are only very loosely connected. They will resist the temptation to turn causality on its head; instead of looking at outcomes and assuming they made them happen, they will look at their forecasting methodology and analyse how often it produces winners and losers. As all betting professional know, the settlement of an individual bet has little or nothing to say about its underlying value. Rather perversely, and perhaps most importantly of all, intelligent bettors would prefer to lose with a positive expectation than to win with a negative one. If you can detach yourself from the emotions of money making and losing, and focus only on the expected value of a bet, then you will be much better prepared to handle the roller coaster that is sports betting.